In order to provide the finest range of RH View Box, we engage in using the finest raw materials and modern technology. Used widely for the purpose of measuring the RH factor in blood, its efficiency is highly commendable. In addition, we offer this range of products at the best rate possible. 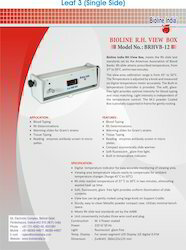 Bioline India RH View Box, meets the Rh slide test standards set by the American Association of Blood Banks. Rh slide attains prescribed temperature, from 37° to 39°C, within two minutes. The view-area calibration range is from 45° to 50°C. The Temperature is adjusted by a knob and measured on digital temperature meter accurately. The Built-in temperature Controller is provided. The soft, glare-free light provides optimal intensity for blood typing and cross matching. Light intensity is independent of the temperature control. Accurate monitoring of viewing area. Looking for RH View Box ?